On June 23, the Supreme Court tied in U.S. v Texas. The Court’s 4-4 deadlock upholds the lower court’s decision to suspend the Deferred Action for Parents of Americans and Lawful Permanent Residents (DAPA) and the expanded Deferred Action for Childhood Arrivals (DACA) programs. The suspension of these programs will stop any economic and social benefits that would have resulted had they been implemented. Moreover, this tie confuses the precedent for executive action on immigration. Above all, one thing remains clear: Congress needs to pass comprehensive immigration reform in order to address the millions of undocumented immigrants currently in the United States and to stop future undocumented immigration. As described in a previous article by the Council on Hemispheric Affairs (COHA), this case addresses the executive actions from November 20, 2014, when President Obama expanded the existing DACA program and introduced the DAPA program. This executive action authorized the Department of Homeland Security (DHS) to defer deportation, permit work authorizations, and provide ancillary benefits, such as social security and Medicare, to groups of undocumented immigrants based on residency, absence of criminal records, and family residence. Moreover, President Obama waived the age requirement for DACA and lengthened the time granted for DACA benefits. Together, these programs were estimated to impact more than four million undocumented immigrants. This would have affected significantly more people than all past immigration executive actions, which affected 200,000 people at most. The only exception was President Kennedy’s program in 1961 to assist Cuban refugees that affected 1 million people. U.S. Citizenship and Immigration Services (USCIS) planned to begin accepting applications for expanded DACA and DAPA on February 18, 2016. However, after 26 states challenged the constitutionality of these executive actions, a Texas District Court temporarily suspended both the implementation of DAPA and any expansion to the existing DACA program. The Supreme Court tie indefinitely prolonged the suspension of these programs. 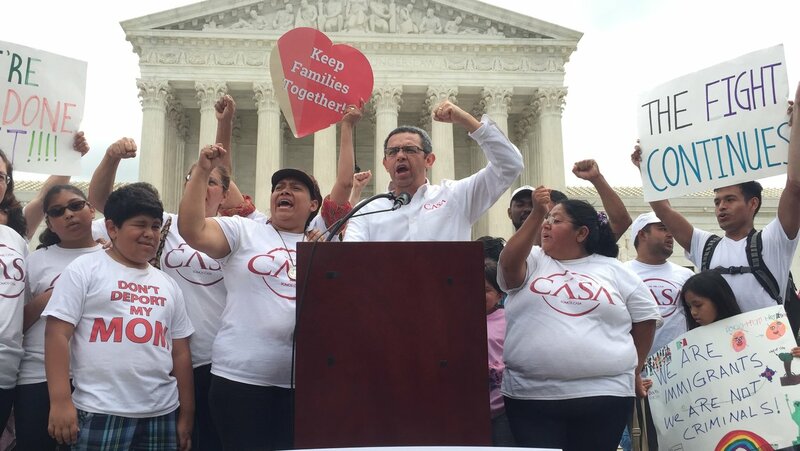 As a result, millions of families will no longer be able to reap the benefits associated with DAPA and expanded DACA. To say millions of families are disappointed by this outcome is an understatement. DAPA aimed to keep families together by deferring deportation of parents of U.S. citizens and lawful residents. The Department of Homeland Security has reported that Congress has only allotted resources to deport 400,000 undocumented immigrants each year. Therefore, millions of undocumented immigrants will remain in the United States. Without the DAPA program, those remaining families live in fear that at any time their loved ones could be sent back to countries fraught with issues such as homicide and political corruption. This fear continues to plague millions of people every year. In addition to this social problem, these programs also considered how undocumented immigrants could contribute to economic growth through work authorization. In his remarks on the Court’s recent decision, President Obama discussed the troubling issue of work authorization for families seeking financial stability. The President indicated that the lack of work authorization will hinder the positive economic growth that these programs hoped to bring. In The Economic Effects of the Administrative Action on Immigration report, Obama’s Council of Economic Advisors optimistically predicted a 0.4 percent increase to GDP, a $25 billion USD decrease in the federal deficit, a rise in wages for U.S. born workers, and growth in state and federal tax revenue by the year 2024. This demonstrates the idea that any type of immigration will result in positive economic outcomes for individuals and for national wealth. Without work authorization, recent undocumented college graduates will not be able to obtain jobs or positions for which they are qualified. As for the future of immigration in the United States, the Supreme Court has effectively decided to not set a precedent. In other words, by failing to come to a consensus, the Justices only furthered the debate over the constitutionality of the President’s actions. For example, during the demonstration in front of the Supreme Court after the decision, much of the conversation was focused on the “bigger, broader, and bolder” executive action that presidential candidate Hillary Clinton would enact if she is elected in November. At the same time Speaker of the House, Paul Ryan, stated for CNN that this was a “victory in our fight for separation of powers.” Therefore, despite the Supreme Court’s decision, there is still widespread debate regarding whether presidential executive action can be used to grant deferred action and work authorization to an unprecedented 3.7 million people. During the demonstration, there was further rhetoric surrounding the November presidential election. Indeed, candidates Hillary Clinton and Donald Trump have presented bold and distinct immigration plans, and their lack of common ground only heightens polarization. One of the claims the representatives made is that there are 45 million U.S. citizens in the Latino community who will vote for Hillary Clinton because she promises to protect rights for the undocumented community. At the same time, Donald Trump’s no-tolerance policies attract voters who fear that giving benefits to undocumented immigrants will encourage more undocumented immigration. No matter how essential it is, compromise appears to be impossible between these two candidates, which indicates that immigration reform might be a distant dream. One thing upon which Republicans and Democrats both seem to agree is that comprehensive changes to immigration laws are essential. These changes need to address the 11.5 million undocumented immigrants living in the United States, while also addressing the future of undocumented immigration. When President Obama announced his executive action in November 2014, he said, “to those members of Congress who question my authority to make our immigration system work better, or question the wisdom of me acting where Congress has failed, I have one answer: Pass a bill.” Congress has still failed to find any common ground on these matters and the 2016 presidential candidates exemplify how polarized voters are on this issue. Many Americans believe that Obama did not have the authority to pass these programs. From this case, it is obvious that executive action is never going to effectively be a long term fix for the undocumented immigration situation in the United States. Although DAPA and DACA would have helped undocumented immigrants in the United States, these initiatives must be undertaken by Congress rather than the President. An immigration bill would need to create an avenue for undocumented immigrants in the United States to contribute to the economy and to improve the social well-being of communities. Additionally, it is equally important that this bill address the broken legal immigration system in order to prevent this situation from further escalating. Featured photo: June 23 demonstration outside the Supreme Court. Taken by Jennalee Beazley. Defending DAPA and Expanded DACA Before the Supreme Court.” Immigration Policy Center. Accessed April 11, 2016. http://www.immigrationpolicy.org/special-reports/defending-dapa-and-expanded-daca-supreme-court. The Economic Effects of Administrative Action.” Whitehouse.gov. November 2014. https://www.whitehouse.gov/sites/default/files/docs/cea_2014_economic_effects_of_immigration_executive_action.pdf. De Vogue, Ariane; Kopan, Tal. “Deadlocked Supreme Court deals big blow to Obama Immigration Plan.” CNN. 23 June 2016. Accessed 23 June 2016. Remarks by the President in Address to the Nation on Immigration.” The White House. November 20, 2014. https://www.whitehouse.gov/the-press-office/2014/11/20/remarks-president-address-nation-immigration. Uruguay’s Tabaré Vazquez: Pink Tide or Political Voice of the Center? March 4, 2006 COHA Comments Off on Uruguay’s Tabaré Vazquez: Pink Tide or Political Voice of the Center?